This episode of Muqabil laid down the foundations for what is coming ahead. Although everything that the viewers were shown in this episode needed to be seen but it also had a lot of scenes which could have been chopped down. The pace of the drama has slowed down considerably but it is still unpredictable and has some phenomenal performances to its credit. Every episode has some new development which gives you a reason to tune into this drama the coming week. This play could have been a game changer if it maintained its fast pace and there weren’t a lot of filler scenes which are clearly meant to kill time. This episode however was not a filler episode overall because with this episode Pareesa learned a few things about her which she was not willing to accept before and the dynamics of Arman and Pareesa’s relationship also changed completely this week. Half of this episode covered everyone’s mindset while they were desperately looking for Arman. In my opinion this could have been one of those episodes which keep you at the edge of your seat if the preview of the next episode did not reveal that Arman was in the hospital. The song covering Pareesa and Arman’s past scenes and the visit to Sara’s house did not serve any purpose at all. The only important aspect of Sara and Pareesa’s conversation was that for the first time the viewers watched Pareesa acknowledge the fact that she was in love with Arman. The biggest purpose that these recent developments served is that Pareesa has finally accepted her true feelings for Arman, she is not afraid to love him and she is not scared of admitting how much he means to her. Pareesa, Arman and Mahmood’s characters are the lifeline of this drama, no matter how meaningless an episode is as a whole, these three characters always add meaning to every episode and keep it from getting too dull. My favorite scene in tonight’s episode was the one in which Arman looked at Pareesa and his father for the first time after his accident (suicide attempt?). It was brilliantly directed and Mohsin Abbas’ acting was beyond remarkable in this scene. It showed exactly how Arman felt at that moment but was unable to express his feelings in any way. Honestly speaking, I was expecting a lot more from this episode but it did not cover Pareesa and Arman’s scenes the way one would have hoped it would but on the contrary focused on showing the aftermath of Arman’s disappearance. I have always been a big fan of Asif Raza Mir but now I am completely sold. His expressions when he warned Pareesa that she should never share her secret with Arman were remarkable. He brings out all the shades of Mahmood’s personality effortlessly on screen. 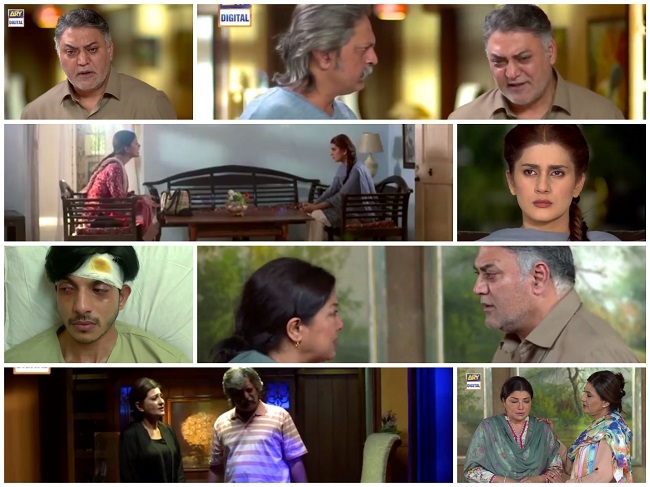 Shehnaz and Aftab’s scenes covered Aftab’s guilt and also a different side of Shehnaz’s personality. Saba Hameed is also an all time favorite and Saife Hassan is very convincing as Aftab. These people may run a big business but they have no clue how to handle their daughter, that is something they are still learning to do! The preview of the next episode suggested that Arman will take his time coming into terms with the fact that his father was the one who violated the woman who is now his wife. So far Muqabil has picked up pace every time the viewers thought it had lost its momentum therefore I have high hopes that the next episode will deliver.